It all started with songwriting for this talented young performer, and it was well before he knew how to read a note. 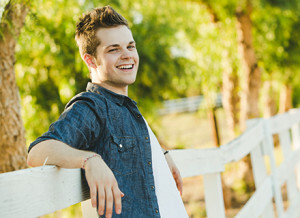 Skyler Clark-Hamel, known as “Skyler” to his fans and friends, has been writing music since he was just five years old. He credits his mom for his passion for music after introducing him to the Beatles when they were driving around in the family station wagon when he was in grade school. “I was a total fan, and I loved watching a Hard Day’s Night and seeing all the screaming girls going berserk in Liverpool”, he stated. It looked like so much fun and at that young age he decided he wanted others to love his music the way the Beatles music was loved. Training on drums, guitar, bass and piano kept him busy through middle school. Since then Skyler has written over 100 songs, and produced several albums and EPs (Long Gone, Take You Away, Restless Heart, and One Voice). He has worked with professional producers in Boston, LA and Nashville, and has also self-produced many albums. Skyler is a committed artist who won’t let obstacles and challenges interfere with his vision. 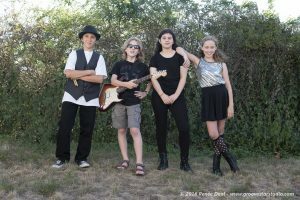 After a year at Berklee College of Music, Skyler set out with his band to travel the country and perform and produce new music. Many times, he felt he had the right attitude and commitment from his bandmates, only to discover they were not on the same page and wanted something very different. One became a missionary, one couldn’t manage all the traveling and one wanted to be closer to home. It was so much tougher than he thought, and was a lot of starting and stopping. It was something he couldn’t control no matter how much confidence he had that the bandmates were in alignment. He soon realized the one thing he could control was himself. After being in several bands, Skyler recently packed up his car and headed from his apartment in Concord, MA to Nashville. He will follow through with his commitments with his current bandmate in the duo, Skyler and the Brit, but at the same time will be focused on his solo career. Finding another artist that is aligned with his intentions is the top challenge, he explains. The duo is traveling the US performing at college shows which he said provide great financial security and national exposure. This month they will be in Washington, CA, OH and UT, and you can tell he just thrives on a busy gig calendar. 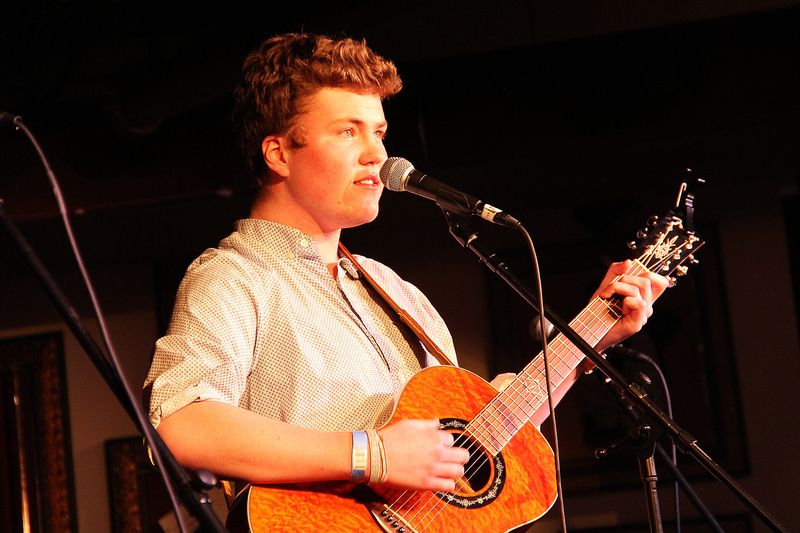 Skyler loves to tell a story with his music which captivates audiences. He has performed in many Young Performer Club events and has been a guest performer at our showcase competitions. What makes him unique is his natural audience connection and effortless smooth vocals. You feel like you are the only one in the audience and can feel his passion and love for performing. He is also a professional, following up right away on phone calls and emails as he knows every opportunity gets him one step closer to making it. In 2014 he was awarded “Best Small Venue Artist” by Campus Activities Magazine. Whether solo or with his many bands, Skyler has performed over 500 shows in venues of all sizes and has shared the stage with the Goo Goo Dolls, The Band Perry, and Daughtry (to name a few). In 2012, he appeared on the X Factor, was the national spokesperson for Safe Teen Driving for the AllState Foundation, and had his song, “Stephanie,” used in a Supercuts commercial. Skyler feels you need to pay attention to being happy first and then success will follow. At first he had his priorities backwards he admits. He will continue to be fearless and learn through each engagement, music relationship, challenge and accomplishment. While he describes his past experiences with bandmate relationships as devastating, he now recognizes there are other positive directions to go in and that being dependent on himself will only continue to strengthen his quest to become a well-recognized career artist with screaming fans. There are not many artists who can escape the challenges present in relationship dynamics, so stay focused on your mission and career goals, and keep your goals in clear view at all times. We first saw Andrea, 17-year-old singer songwriter, at the Stand Up To Bullying concert at Tsongas Arena a couple of years ago, and we knew we wanted to hear more. It is rare to see young singers perform 100% live and sound like it is a performance worthy of recording, but Andrea has a rare melodic, smoky and pure voice that is naturally effortless. Her multi-octave voice has a hint of rasp and tonal accuracy that is smooth and comforting. She has a powerful combination of jazz and soul that that captivates audiences and attracts heavy online viewing attention. Andrea is also a serious songwriter who focuses on caring topics. The anti-bullying song, “Never Look Down”, was written to help kids who are bullied to stand tall and strong. The chorus sends a powerful message… “Strong is pretending everything’s alright, and strong is smiling when your throat is tight”. Andrea has performed at several Music On & Up events including the Keene Pumpkin Festival, the Hampton Beach Seashell Stage, and she was a Grand Finale Finalist in the Music ­­­­­­On & Up Showca­­­­­­­­­­se. She is also very involved in her school’s theater group and has been in the lead role of many productions. As her online bio highlighted, Andrea wrote the theme song to Standup 2011 (sponsored by McDonalds), collaborated with Issa Pointer (of the multi-platinum Pointer Sisters), and was selected to write a song for an award winning PBS documentary entitled “GOODNIGHT” highlighting the career of legendary Image Maker, Paul Goodnight. Her most viewed video on YouTube is “What’s Right” and it has over 100,000 views. Andrea was inspired to write the song about a brave soldier and his inspirational wife who cherishes his memory after he gives his life for our country. The project is designed to entice patrons to donate money to the MA Troop Welfare Council and support the families of fallen and injured troops. The MA Troop Welfare Council will donate all of the proceeds from the sales of this song on iTunes to the organization so that they can be used to benefit those who have lost a brave soldier of their own. We were impressed to learn at the time we did this interview, that Andrea was just admitted to the Clive Davis Institute of Recorded Music at New York University, a highly competitive school. The program is the first of its kind to provide professional business and artistic training toward a Bachelor of Fine Arts degree for aspiring creative entrepreneurs in the music industry. Andrea’s on stage beauty and captivating vocals make her a standout performer, and one who will attract top industry attention. We will look forward to hearing new originals and following her career as a singer songwriter and music entrepreneur. How long have you been performing and practicing music? I’ve been performing since I was really young, around seven years old. What was it that sparked your interest? My mom put me in dance, and there was always a singing lesson going on in the room next door. I was always more interested in what was going on in that room than my dance lesson, so I transitioned over to singing lessons. Describe your music. What type of artist are you? It’s changed a lot I think mainly because I get inspired from many different styles of music, but my heart lies with soul and jazz. I am currently training with Claudia Neault from Bridgewater, MA. I’ve been writing since the 6th grade. I love to write about love and heartbreak for the most part. I have my originals out on iTunes and YouTube. I have written songs about anti-bullying, and one for veterans as well. Please check them out! What artists have been your biggest inspiration? I love Alicia Keys, Tori Kelly, Sara Bareilles, Sam Smith, Elton John, Frank Sinatra, Beyonce, John Mayer, etc. It’s a very long list! What are your top music goals? My top goals are to be successful in the music business; as an artist, writer,and entrepreneur. Whatever it may be, I know I’m supposed to be in this game. What/who inspires you when you write music? Usually my relationships at the time, or a movie/book I’m interested in. I am kind of a hopeless romantic. What has been your major accomplishment? One of the things I am most proud of is my acceptance into New York University’s Clive Davis Recorded Artist Program! Only 40/400 are admitted so I feel extremely honored to attend and really turn my music passion into my career. Performing and writing up tempo pop songs. I really love old music and songs that aren’t really on the radio, so it’s hard for me to play songs that please all audiences. To record, write, gig, and save money for college. What advice do you have for artists starting out? Focus on the music, I feel like I see too many artists trying to make people buy their CDs and follow them on twitter and what not. People should let that stuff come naturally. If you’re good enough, you’ll get somewhere. For me it’s all about the quality and passion behind a musician. What are your weaknesses and what do you do to overcome them? My weaknesses are definitely being too acoustic and maybe not “pop” enough for the radio or the average listener. I feel I need to sing less slow songs and more up tempo songs! My favorite gig was singing at Mayor of Boston, Marty Walsh’s Inauguration,, my junior year of High school. What social channels are you on and what sites do you recommend artists be on? We selected Shane Guerrette as our first “Spotlight” performer based on his unique style, undeniable commitment to music, silky comforting vocals and genuine love for his guitar and creating music that helps others. 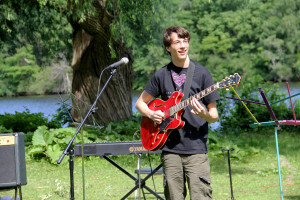 Shane Guerrette is a 17-year-old indie pop performer from New York. The Young Performers Club first met Shane and his brother Brandon at the Music On & Up Showcase qualifier in October 2013. His passion traveled throughout the audience and the room was completely still creating a natural spotlight on him and his guitar. When the audience feels the passion they are listening to a true star! Patty Duffey, Director of the Music On & Up program, commented following the judges selections, that Shane would be spotted very soon by some industry labels based on how he effortlessly stands out. He has an impressive 1.5 million views on YouTube on just fifteen videos posted, and he has 39,000 subscribers. In 2014 Shane participated as a guest presenter and performer in the Real Deal Workshop, sponsored by Strega Entertainment and the Young Performers Club. 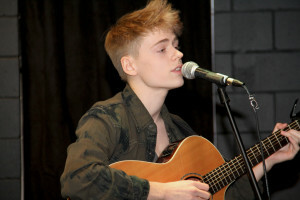 I started performing more seriously when I was fourteen, but have been singing my whole life. It has mostly been in my room. When did you and Brandon start performing together? Last summer we started creating music together. Brandon was a Berklee School of Music student focusing on drums. I discovered how much his drums add to my music so it has been a great for both of our music careers. I take lessons with Mike Ward and have to say he is the best teacher I have ever had. I started the previous summer and had a goal of writing ten songs. I have eight fully completed and two almost there. I play for hours when I am creating music and love coming up with edgy cool melodies. Then I add in the lyrics. I write about anything from having a bad day to having a good day. I don’t write songs they write me! Get an album out on iTunes, tour around the country, and then tour around the world. Your hair is much talked about. What inspires your style? I have a lot of hair so I just let it do its thing and be crazy messy. People refer to it as “flow”. I don’t want to look like other artists and like having my own look. Your YouTube channel with over 200,000 views is impressive. What helps drive your numbers? Staying current with popular covers and frequently posting new songs. I make sure my performances are real and like taping in my home the best. I just signed a management contract with SRP Music. They saw me on iTunes and asked me to meet with them at their NYC offices. My album will be a collaborative effort with SRP helping co-write songs, writing songs for me and working with my originals. The idea is to find the songs that will be hits. Play honestly, keep on playing, post your songs on YouTube, learn from negative comments, take risks, learn what you are doing wrong, stay positive all the way along, and learn ways to improve. A Make-A-Wish event in NYC. It was a star like moment with a cool light show, huge stage and amazing backdrop. It felt like a legit concert. What social channels are you on and do you recommend? What is your favorite original? How is it working with your brother Brandon at shows? He brings my music to a whole new level and makes my songs ten times better. He is great on the spot on flows with the song. He works hard and had been studying at Berklee for two years. We wish Shane luck with his new management company, and look forward to his first album release. Shane is a finalist in the Young Performers Grand Finale taking place at the Boston Hard Rock Cafe on April 4, 2015.